Note: For provisioning services, we define enhancement to mean increased production of the service through changes in area over which the service is provided (e.g., spread of agriculture) or increased production per unit area. We judge the production to be degraded if the current use exceeds sustainable levels. For regulating services, enhancement refers to a change in the service that leads to greater benefits for people (e.g., the service of disease regulation could be improved by eradication of a vector known to transmit a disease to people). 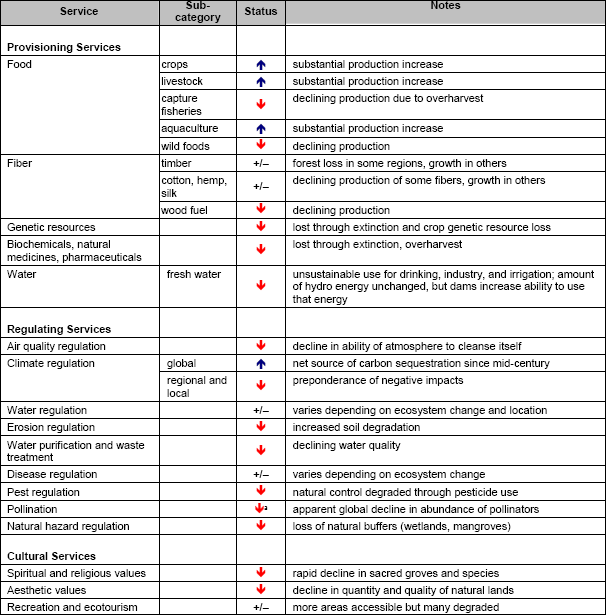 Degradation of regulating services means a reduction in the benefits obtained from the service, either through a change in the service (e.g., mangrove loss reducing the storm protection benefits of an ecosystem) or through human pressures on the service exceeding its limits (e.g., excessive pollution exceeding the capability of ecosystems to maintain water quality). For cultural services, degradation refers to a change in the ecosystem features that decreases the cultural (recreational, aesthetic, spiritual, etc.) benefits provided by the ecosystem. 1. The”substantial production increase” in crops is achieved at the expense of a 5% annual increase in the application of chemical fertilizers. 2. The “substantial production increase” in aquaculture is achieved at the expense of permanent damage to capture fisheries. 3. The substantial production increase in livestock is achieved at the expense of degraded environment, increased use of antibiotics and hormones, use of chicken manure as feed and expanding feedlots industry. 4. Regulating services: Global: “Net source of carbon sequestration since mid-century.” The finding is hotly disputed.